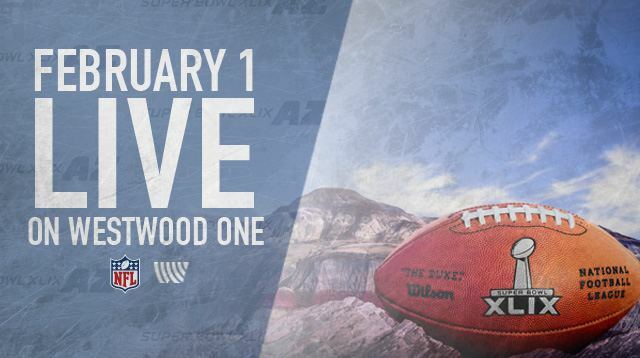 For the 28th consecutive year, and 42nd time overall, Westwood One will be the exclusive radio network home of the Super Bowl. This year’s contest will be played at University of Phoenix Stadium in Glendale, Arizona on February 1st as the New England Patriots face the Seattle Seahawks. It is the second time the Super Bowl has been played at this venue, and the third time in Arizona. Kevin Harlan will handle the play-by-play duties for the Super Bowl for the fifth straight year, and Boomer Esiason will serve as the color analyst—his 15th consecutive with the network. Hall of Famer James Lofton and Mark Malone will once again report from the sidelines. Jim Gray will anchor pre-game and halftime coverage, with appearances by both Arizona wide receiver Larry Fitzgerald and New England quarterback Tom Brady. Scott Graham, Hall of Famer Rod Woodson and Super Bowl XXXIV MVP Kurt Warner will also contribute to the pregame coverage. Our gameday coverage begins at 2:00 PM ET, with “Super Bowl Preview”, co-hosted by Scott Graham and Boomer Esiason, followed by “Super Bowl Insider”, co-hosted by Mark Malone and Hall of Famer Rod Woodson at 3:00 PM ET. At 4:00 PM ET, live coverage from the stadium kicks off with “Super Sunday”, the Super Bowl XLIX pregame show, hosted by Scott Graham. The Super Bowl XLIX game broadcast begins at 5:00 PM ET, with kickoff anticipated to be approximately 6:30 PM ET. The broadcast of Super Bowl XLIX on Westwood One will be available on hundreds of Westwood One affiliates around the United States, on SiriusXM NFL Radio Channel 88, on military bases around the world and hundreds of ships at sea on the American Forces Radio Network, and on NFL Audio Pass from NFL.com. Throughout the week leading up to Super Bowl XLIX, Westwood One Sports will also produce a nightly show, Seven Days to Sunday—The Road to Super Bowl XLIX. This hour-long preview show will air each night during the week leading up to the biggest game of the year, beginning on Monday night, January 26th, and continuing through Saturday night, January 31st. Hosted each night by Scott Graham, the voice of NFL Films, the nightly program will feature interviews with players from the two teams participating in Super Bowl XLIX, as well as coaches and other special guests. The show will also contain a nightly Super Bowl flashback segment, as Westwood One accesses its deep archives to remember previous Super Bowls with old highlights and reflections from some of the game’s greatest legends. Each night’s show will be co-hosted by a different Westwood One NFL analyst, such as Hall of Famers James Lofton and Rod Woodson, among others.